The name of the author of this report, first published by Sime Ljubic in 1880, is unknown, but he was probably one of the Venetian proveditors of Kotor. He seems, at any rate, to have visited many areas of Albania personally. His report provides much information, including many useful details, on the state of a country firmly now under Turkish rule. The country of Albania is that which ancient authors called Macedonia, i.e. only a part of Macedonia since the latter contains many lands and regions which are not Albanian. Albania itself is the part which has the Adriatic Sea as its western border. The said land of Albania extends from the north southwards from between the towns of Antivari (Bar) and Dulcigno (Ulcinj), settlements which are a mere fifteen miles apart. As such, Bar constitutes the end of Dalmatia and Ulcinj the beginning of Albania. The peoples there differ in their languages, since from Bar up to Istria they speak the Slavic language, whereas from Ulcinj down to Vallona (Vlora) and the region thereof, they also speak the Greek language. Thus, this province of Albania, which begins in Ulcinj, extends down the coast of the Adriatic Sea to Vlora and to the so called Cimariotti (Himariot) mountains, known in ancient times as Acroceraunia. In this Albania, only the town of Ulcinj belongs to the Christians under the rule of the most serene Signoria of Venice, whereas the town of Alessio (Lezha), formerly under [Venetian] rule, now belongs to the Turks. Lezha is situated on the banks of the river Drino (Drin), three miles from the sea. Between the said town of Lezha and Ulcinj is the river Bojana (Buna) of which we shall later come to speak. Travelling southwards from the first mouth of the river Drin, one arrives at the other mouth of that river, because this noble river flows into the sea in two outlets, about four miles from one another. And from the second mouth, travelling southwards, one comes upon the river Isano (Ishëm), eight miles away. The river Ishëm constitutes the border and end of the region known as Mattia (Mat) and the beginning of the region known as Reddoni (Rodon). The region of Rodon comprises the land between the aforementioned river Ishëm and the river Arzenta (Erzen) which flows into the sea near the headland now known as the Cape of Palli (Palla) towards the west. All this part of the sea from the Cape of Palla back in a circle past the aforementioned rivers to Ulcinj constitutes a gulf in a north south diameter. Thus, from Ulcinj down to the Cape of Palla there is a distance of fifty miles. From Ulcinj past the aforementioned mouths of the river Drin at the east, with Ulcinj itself to the northwest and the Cape of Palla to the southwest, one follows the curve of a gulf for thirty miles, which is situated between these two places, i.e. between Ulcinj and the Cape of Palla. Thus, travelling along the gulf of the Drin from Ulcinj to the river Buna, from the Buna to Lezha, from the mouths of the Drin to the Mat, from the Mat to the Ishëm, from the Ishëm to the base of Rodon, from Rodon to the river Erzen and from the Erzen to the Cape of Palla, where the gulf of the Drin comes to an end, one covers a circuit of about seventy five miles. Setting off from the Cape of Palla southwards, one comes to the ancient city of Durazzo (Durrës), twelve miles from the Cape of Palla. 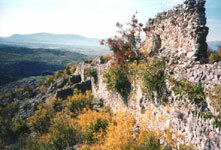 The city of Durrës is now small, compared to the former and ancient grandeur of its walls. Durrës lies by the sea with ancient and weak walls, but is stronger in location as it has been strengthened somewhat by the construction of two fortifications, one to the east built five years ago and the other to the west. The city is quite strong with respect to its natural setting, surrounded as it is by cliffs. As such, galleys cannot dock here, but must anchor quite a distance out at sea, and little boats would have to be used to land soldiers who could not even disembark at the base of the town, but would rather have to wade ashore over the distance of an arrow's shot. The city of Durrës, which once belonged to the most serene Signoria of Venice, is commanded by two hundred janissaries, two hundred azaps and three hundred Turkish irregulars, all on guard, who are convinced that they are going to be attacked by the mighty forces of the most serene Signoria. For this reason, they have taken all necessary precautions to defend themselves and evacuated the women and children. Nonetheless, landwards the city is weakly defended because nearby there are earthen mounds there, devoid of stones, which rise higher than the fortress itself. The fortress is surrounded by a moat, but one which is both narrow and shallow such that anyone could position his artillery there and pound the walls, which have not been kept up, but are rather worn down and no more than one stride thick, made of dry rock and limestone. The city is situated on the western slope of the hill facing eastwards and stretches down to the seaside. It has no rivers or springs and as such, is lacking in water. At a shot's distance outside the town, there is a well from which the city draws its water. Further on, there is a source of flowing water, but its flow is very limited. On the other hand, [Durrës] is abundant in brackish water, marsh and saltwater. Since it is at the centre of Albania, the city can always be aided by the Turks of the region who can get there with substantial forces of cavalry to defend it within the space of one or two days. The port in Durrës consists of a long bay stretching from north to south for over four miles down the coast. The diametrical distance from Durrës to the Cape of Lacchi (Lagji) is eighteen miles north south, whereas the coastline itself curves around to the east of these two places like a gulf. From the Cape of Lagji, travelling southwards for six miles, one comes upon the mouth of the river Scunbine (Shkumbin), which resembles more of a stream than a river because it has little water in the summer, and in the winter, is no more than three and a half feet deep at its mouth. From this river to the next one which is called Pirgo (Pirgu), known to others as Dies Carvastri, stretches a sandy beach covered with trees and vines. These two rivers are about twenty five miles from one another. This stretch [of the coast] is part of a swamp, or rather a lake from which springs the river of Appollona (Apollonia), a haven and lair for pirates. At the mouth of the Apollonia, there are usually three and a half to four feet of water. From Apollonia, sailing southwards down along the aforementioned beach, one comes to the mouth of a river known as the Voiussa (Vjosa) with many sandbanks in the water. From the Vjosa, one continues to the Plava, where the aforementioned beach comes to an end and where the little bay of Vallona (Vlora) begins. From the Plava, one can see Cape Lenguetta (Karaburun) from the south to the north, with the island of Saseno (Sazan) to the west and the coast of Vlora to the east. As Karaburun belongs to the land of the Himariots, Albania comes to an end here at the water's edge. Let us come back now to describe the other borders [of Albania] in the north and the east. From Ulcinj, one sets off in a southeastern direction to Scuttari (Shkodra), a mighty city with regard to its site and which once belonged to the most illustrious Signoria of Venice. Being located on top of a high hill of hard rock, the city has no fear of being ravaged by artillery because, though there is another hill to the east, the latter is at a distance and much lower than the level of the town. It was from this site that the Turks planned to bombard the town, but was unable to do any more damage than hitting some of the roofs of the houses. The city was taken by siege, but by contemporary methods. I do not believe there is any fortress with such a site which could be taken otherwise. The city is situated between two noble rivers, for the Buna flows from the lake they call that of Shkodra, at the mouth of which the city is situated. After a course of a mere twenty four miles, the Buna flows into the sea, the outlet of this river being between Ulcinj and Lezha with the river Drin. The town of Ulcinj is only twelve miles from the mouth of the Buna and eighteen miles from the Drin. The mouth of the Buna is six, seven to eight feet deep, especially in the summer. The bed of this river is very deep such that large ships can enter it and, in the past, Venetian galleys used to sail up the river for a number of miles to a village called Serzi (Shirq) near Shkodra. From there to Shkodra itself, the course of this river, which divides into many channels, is shallow and can only be navigated by vessels made of one tree and by lightweight boats. This region, which extends from Ulcinj to Shkodra, with a distance of only twenty four miles between the two towns, is exceptionally beautiful and is fertile in all manner of produce. It produces great quantities of grain and honey not only for domestic use. It also exports grain by sea in great quantities, though secretly and against the will of the Turks. Shkodra has wine and meat in abundance, as well as fish in great numbers, because its aforementioned lake has a circumference of over ninety miles of fresh water, containing every sort of fish for all seasons. The fishermen there provide a great source of income to the Grand Turk. The other river is the Drin, which is ten miles from Shkodra, and between these two rivers, the Buna and the Drin, are exceptionally beautiful and fertile plains. The river Drin then flows southwards through a very beautiful plain called the Sadrina (Zadrima) and continues on to the ancient town of Lezha which now has a fortress at the top of the mountain, and below it, on the banks of the said river, there is a settlement inhabited by Christians only. It flows westwards into the sea with two outlets, as has been stated, and gives its name to the aforementioned gulf, called the Gulf of the Drin or Ludrino. At the upper outlet of the said river, to the north, there are two harbours, one called S. Zuanne della Medoa (St. John of Medua / Shëngjin) three miles north of the said outlet, and the other called Sacca (Saka) which is to the south. To continue the description, it must be noted that, beyond Shkodra, to the southeast, Albania is bordered by mountains called the Spani. At the foot of these mountains and of the Docagini (Dukagjin) mountains, flows the aforementioned river Drin, which arises in the lake of Ocrida (Ohrid), a town in the interior. This lake is extremely pure, has a circumference of forty miles, and is very abundant in excellent fish, in particular, in great quantities of trout. The river Drin takes its origin in this lake and, stemming from the southeast, it flows in a northwesterly direction through many rocky gorges and joins the other river, which is known to the natives as the White Drin, above the Dukagjin mountains, forming the end and border of Albania, and separating it from certain places called Hassi (Has). Since those places are to the east, it can be said that Albania itself has on its eastern border the aforementioned Dukagjin mountains, as well as those of Taudi and the region of Terra Nuova (New Town), now called Albassan (Elbasan) by the Turks, above which are the mountains of Spateteria (Shpat) and the mountains of Corza (Korça), stretching down and terminating in the southeast and south at the aforementioned Himariot mountains, which are called Himariot on the coast, but which have other names in the interior. The mountains of Albania are covered with all manner of trees and are abundant in springs. There are inhabited and cultivated hillsides and beautiful broad plains, beginning with the spacious plain of Savra, known also as Mussachia (Myzeqe) which extends between Vlora and the city of Belgradi (Berat), and in the north, stretches up to the river [Shkumbin] and to the fortress of Daisti. There are the plains of Elbasan, the above mentioned New Town, the plains of Tiranna (Tirana) which stretch from the castle of Petrella (Petrela) to the city of Croja (Kruja), the plains of Curbin (Kurbin), through which, as mentioned above, the river Mat flows into the sea in two outlets, and the fair and pleasant plain of Zadrima. There are also extremely fertile plains known as Sopra Scuttari (Upper Shkodra) as well as those of Sotto Scuttari (Lower Shkodra) which extend to the river Buna. These are all most abundant in every sort of grain, meat, fish, wine and fruit. Some of these places have soft tars, as have the mountains of Dukagjin in great quantities, which are often transported down to the wharves at Lezha on the Drin. I have seen them being sold at three or four big pounds for a soldo. The region of Vlora produces hard tars from the earth, which nature offers much as it does minerals. There is an infinite amount. I remember that in Vlora, tar was being sold at forty-five aspers for a miaro, and in recent times, it has become quite expensive because of certain individuals who have taken over all the tar trade. Albania is rich in water, rivers and springs. It has seaports, though Durrës alone is capable of receiving large numbers of ships due to the aforementioned bay which extends to the south of it. There are two other harbours, mentioned above, which belong to Lezha: St. John of Medua (Shëngjin) and Saka, which are both large enough. There are also other disembarcation points which might be called harbours in the summer: at Rodon near the river Ishëm, the Cape of Palla and the Cape of Lagji, all near to the shoreline. The cities in Albania under the Turks are of little importance because most of them were destroyed in the wars of the past. One, for example, is Shkodra with its fine location, near which is an ancient and extensive town, though virtually deserted, called Drivasto (Drisht), situated across from Shkodra to the east, Shkodra being accordingly to the west. [Drisht] was built on a high and spacious hill at the foot of the mountains called the Spani which are most abundant in springs, torrents, mills, fish, grain, wine, fruit and all the other necessities of life. It is inhabited by the Turks, but is not well off because of the surrounding Albanians who live in those mighty mountains and who refuse to give the Turks their full obedience. This town has a relatively well fortified castle on the summit of the hill. But now, wishing to continue [the description] from north to south, [I must note that] twenty-four miles from Shkodra is situated the castle of Lezha on the top of a mountain, with low and weak walls encompassing about eighty houses which are inhabited by Turks only. Thirty miles to the south of this castle is the town of Croia (Kruja), famous for its wars and for the defence put up by the great and valorous captain Scanderbeg of Albania. This town is twelve miles from the sea where the river Ishëm comes to an end. It is situated at the foot of a high mountain, on a promontory of solid stone with high cliffs, from which it cannot be attacked. It has ancient style walls of small circuit, but is rich in water and flowing fountains everywhere. In the middle of the town, there is an open cavern at the end of which water flows out of the solid rock, as if from a cistern. It flows westwards out of the rock face below the town with so much water that it could turn a millstone. Indeed, this source of water is similar to the many other fountains of fresh water of which the town disposes. The inhabitants use it for cooking and for watering their horses. To my taste, it is very good to drink. This city is strategically positioned from all sides; only from the north could it be attacked from a hill which is of the same height. But between the city and this place, there is a rather deep valley. The Turks consider the city of Kruja to be formidably strong because they were never able to take it by force, but won it over only by siege. It is situated in an extremely fair site with strong and fitting winds. It abounds in grain, oil and meat, not to mention its wood, Albania being everywhere very rich in all types of wood. On the coast in particular and along the rivers, it is full of forests and of wood suitable for every sort of work and for all types of vessels, big and small, as well as for large fleets. Beyond the said city of Kruja, to the west, is a castle known as Pressia (Preza) in the region of Rodon, constructed by the Turks not too many years ago. It is a very weak [fortification] and serves only to keep the local inhabitants under control. From this castle towards the southwest on the coast is the aforementioned city of Durrës. Returning up to the east, one comes upon two castles built on hills which are at quite a distance from one another. Of the two, the one called Andronellio (Ndroq) is the weak one, whereas the other, called Petrela is the strong one. From the latter, travelling in a southeastwardly direction over certain mountain peaks, one descends to the fine, fruit-bearing plains of the aforementioned city of Elbasan. This New Town is of a good size, situated as it is on the plain, and has a thousand Turkish households, surrounding which is a large quarter of Turks and Christians. It is a trading centre very rich in all sorts of goods. The town has walls, a quadrangular tower and a moat, though all very weak. There are no watchmen by day or by night, nor do they lock the gates. There are many fountains, in addition to the water channels used by individual homes. Almost everyone has flowing water. Inside the town are water mills driven by water brought in from not far away. From New Town, one may proceed to Berat which is situated on a high hill not far from a lofty mountain called Tomor. This town is very weakly defended on the north side, though it is surrounded by walls and is quite large. Beneath it is an exceptionally beautiful quarter with all sorts of goods. In these cities, Berat and New Town, they produce large quantities of hides and silk. All of this region abounds in the necessities of life. There are five sanjaks in Albania: i.e. Vlora of which I have not spoken because it is known to everyone, the Sanjak of Elbasan which is the same as that of Durrës, the Sanjak of Ohrid, the Sanjak of Dukagjin and the Sanjak of Shkodra. Of these, Shkodra and Vlora are sanjaks of importance with many irregular cavalrymen, though last March, the sanjakbeys of Vlora, of Elbasan and of Ohrid set off with all of their cavalry, summoned by the Grand Turk, to go, as they said, to Caramania for the war in Cyprus, whereas the sanjakbeys of Shkodra and Dukagjin remained at home. The city of Ulcinj, which we touched upon earlier, is situated upon a cliff, partly over the sea and partly over land. Towards the sea, if they were to construct walls on the western side or to build a bastion at what is called San Domenico with six to eight pieces of artillery the cliff descending there and the [existing] walls being delapidated and old they would have nothing to fear from any fleet, regardless of its size, since the site of San Domenico is quite narrow and the rest of the city is higher up on inaccessible cliffs, from which those inside could bombard a fleet from many sides without being attacked themselves. But there is danger from that place and, as I have said and as experts realize, it would have to be fortified and rendered impregnable. To tell you the truth, with the state it is in at the moment, it constitutes an extreme danger. On the inland side, the town is situated on high cliffs and the walls are thin and aged. If they were to be repaired, as is done nowadays with supports and other facilities, enemies would never be able to penetrate it. And though it has a castle in the highest part of the town, constructed on a high and eminent site, and though the walls are high - thin and worn down as they are - the town could nonetheless be attacked here with artillery from the nearby hills. But even if the walls were to crumble, the enemy would not be able to penetrate [the town] because they would have to climb to quite a height. If measures were taken here to fortify the site and its flanks, and to equip it with requisite material, the town would not need to fear an enemy [attack]. Since it is the first and the last town in Albania to find itself under the rule of the most serene [Signoria] and since it is a gateway to all of Dalmatia, this city would, like a cliff overhanging the sea, be the one to endure the fury of the storm, which would break its back. All the Turkish fleets which have entered the Gulf of Venice in recent times, have passed near to [Dulcigno] and, by the grace of God, it still remains under the dominion of the most serene [Signoria]. The sanjaks of Shkodra and of Dukagjin border on Ulcinj and during the last war, they invaded with a great number of troops and ravaged the whole country. But since the invasion took place after the harvesting of the grain and the grapes, the faithful population did not suffer so much as they are now suffering during the present war. For this reason, the current year has been one of mourning for the whole region. The war came quite suddenly when the three sanjakbeys, with over 20,000 infantrymen and over 5,000 cavalrymen, pillaged and burnt down the villages and everything in them. Since that time, as large numbers of people massed into the city, there has been great hunger. But because private and public supplies of grain reached the town from Albania before the war, the people have not all died of starvation and have helped one another. Even though the price of grain has risen terribly, they have managed to survive. Now that harvest time has come, since the inhabitants are not able to reap the grain, they will certainly die of starvation unless they are given assistance from the sea with at least two galleons or corvettes. As they cannot reap what they have sown and as they have no stocks of grain, all of them will perish: the townspeople, the villagers who have taken refuge in the town and the soldiers, too, who have been sent there by Your Grace to guard the city. It must be made known and believed for sure that these faithful souls who have never broken faith, will be overcome by famine or will have to take to the sea in boats with their women and children, abandoning the city and taking upon themselves all the perils of the waves in search of a new life, or they will die faithful and steadfast in the face of the enemy, who is making sorties and ambushes more and more often in the vicinity of the town. If Ulcinj can be saved by two or three galleys or corvettes, the people of the town will be able to escape to Rodon, where they will be received with great care and attention by the Albanians of that region who, despite the Turkish war, have never given the Turks their full obedience. They [the people of Ulcinj] will be able to return from Rodon with great quantities of grain of various types, not only for themselves, but also for the salvation of the city of Antivari (Bar), which is virtually encircled since it is not on the coast. They will also help sustain Budua (Budva), Cattaro (Kotor) and Dalmatia in view of the fact that, in peace time, up to 50,000 stara of grain of various types are exported from the Gulf of the Drin to the city of Venice. Thus, if there is an interest in keeping these towns: Kotor, Budva, Bar and Ulcinj, which is proven by the fact that soldiers and all sorts of arms have been sent there, it will be absolutely essential to send an armed vessel to save them and to guard the coastline from the Bay of Kotor down to Rodon, because there are [only] two frigates of ten benches each and a corvette of sixteen benches at Durrës which have arrived there to lay siege to the town again. If the fleet of the Signoria leaves the Gulf of the Drin, the aforementioned pirates will not permit sailing there, such that the aforementioned towns will be endangered without blood even being shed.